Since we don't find some of the Indian ingredients in Brazil I have replaced them with the local ingredients and tried the patra and to my surprise the results were excellent.. the taste is as good as the original. The leaf I have used is COUVE - a Brazilian green which is wide like cococasia and it served the purpose well. 1. Wash the leaves and wipe them with a kitchen towel. With a knofe remove the thick stems. 2. In a large bowl mix the ingredients mentioned in the ingredients list on top, to make a smooth and thick batter of spreading consistency. 3. Place the leaf reverse siide up and spread the batter evenly. Place another leaf on top of this and repeat the procedure. Usually 3 leaves are perfect for one roll. 4. Now roll the leaves carefully to make a thick roll. 5. Place it in a foil wrap and close the edges. 7. Remove the steamed roll and let it cool. Cut it into slices. 8. 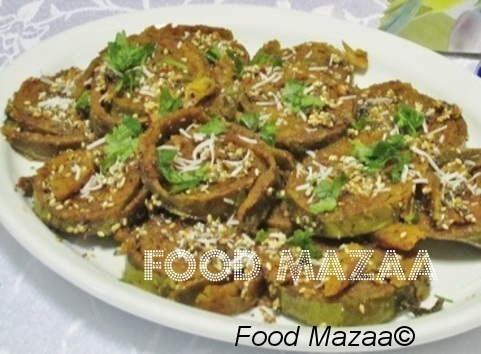 In a flat-bottomed pan fry the tempering ingredients and toss the slices carefully. 9 . Place them on the serving platter and garnish with grated coconut and finely chopped coriander leaves.This snack has a unique taste of it's own and can even be served without any chutneys. 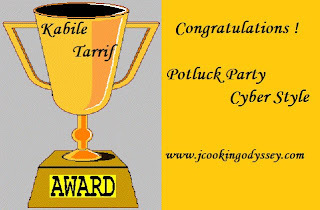 Recieved KAABIL-E-TAARIF AWARD in the potluck party event for this recipe, specially for being innovative in making it with Brazilian ingredients due to the non-availability of Indian groceries here. 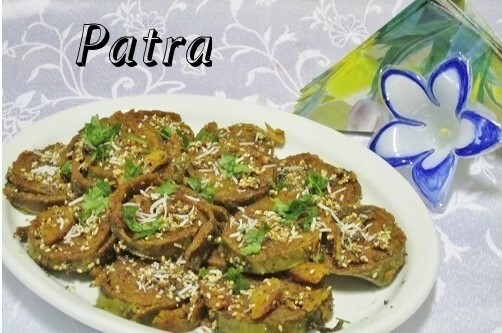 Shobha, as I always said..You are our guru..what a innovative idea to make patra..if I was in yr place main to kabki haar maan leti :) Your indo-brazil patra looks so tempting and tasty !! 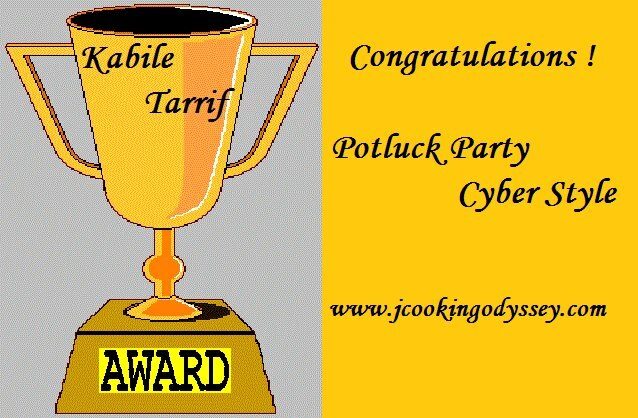 Thank you and well done for participating in Potluck Party !! That's a sweet compliment Jagruti..Jugaad to karna padta hai . Looks delicious, I make this with the really large spinach leaves it works in same way and tastes like patra. Wow.. nice idea.will try that too. Never had a chance to taste these patras,irresistible and droolworthy. 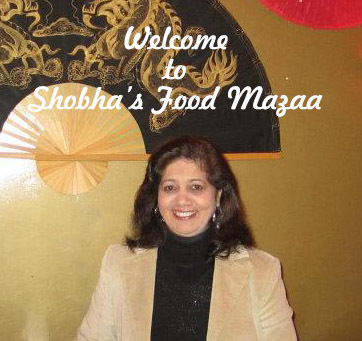 Interesting and delicious snack.. Looks wonderful..
Shobha the patra looks very yummy.Nice snack. Very new to me. Loved this delicious and mouthwatering patra. Will try soon. Very nice substitutions. Thanks for linking.